バルセロナのアグーバルグループが、効率化、技術的な最適化、環境保護などを考え、その拠点である「ザ・アグバール・タワー」の改築を行った。The Agbar Tower, the new corporate headquarters of the Agbar Group in Barcelona, replaces the set of buildings located between Paseo de San Juan and Diputación, and prioritises the concepts of efficiency, technological optimisation and environmental respect; concepts that the philosophy of the Agbar Group is built on. The building of headquarters with these characteristics lays the foundation for the future of the Group and represents far more than a simple change of offices. It symbolises a new structuring of the work environment and a commitment to transparency and effectiveness, traits that are necessary to compete in a constantly changing world. 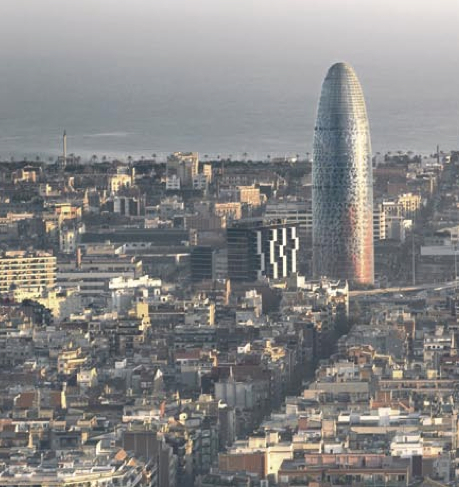 The Agbar Tower is already a symbol of a 21st century Barcelona and embodies the city’s character through its varied aspects. The Agbar Group shares a great many of the values that identify the city of Barcelona, such as its innovative and cutting-edge spirit, or encouragement for environmental respect and sustainability. The Agbar Tower is a clear example of all of this. The use of diaphanous areas, which is one of the most outstanding features of the internal organisation of the building, caters to the new needs of the workplace which require greater fluidity and interpersonal dealings in the taking of decisions. The tower’s large open spaces ease interaction among staff and make communication easier, more transparent and professional. In short, it is a new way of working, an innovation in methods and styles of daily work life that facilitates ongoing communication. The building comprises 31 open-plan floors, free from columns that divide their useful space, and three technical floors that house the building’s management systems. Each floor boasts a headway of 2.60 m and the work stations enjoy natural light through the many windows that surround the entire perimeter of the façade. The total surface area of the building is 39,000 m. Of this space, 30,000 m are set aside for offices that are located above ground level; 3,210 m2 are used as technical floors for the building’s installations; 8,351 m2 to amenities and an auditorium, and 9,132 m2 to parking. The total constructed surface area is 50,693 m2 and the tower is 142 m tall.